Gwyneth Shepherd's sophisticated, beautiful cousin Charlotte has been prepared her entire life for traveling through time. But unexpectedly, it is Gwyneth who, in the middle of class, takes a sudden spin to a different era! Gwyneth must now unearth the mystery of why her mother would lie about her birth date to ward off suspicion about her ability, brush up on her history, and work with Gideon, the time traveler from a similarly gifted family that passes the gene through its male line, and whose presence becomes, in time, less insufferable and more essential. Together, Gwyneth and Gideon journey through time to discover who, in the 18th century and in contemporary London, they can trust. 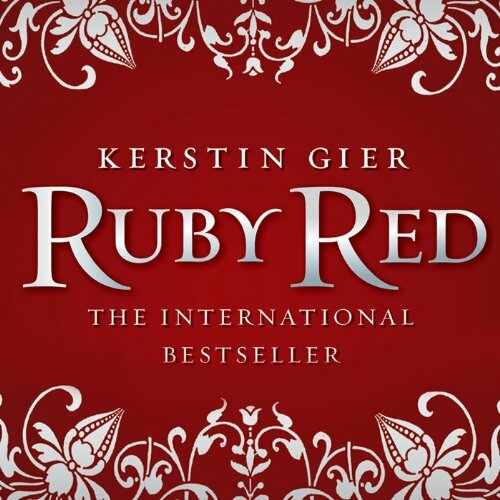 ** spoiler alert ** Ruby Red was a fun, quick, easy read. After reading a more serious book (A House in the Sky), I needed something light and silly, and this was up on an Audible sale for the first in a series. The story is of Gwyneth, the cousin of Charlotte who is the next in the long line of time travellers. The ability to time travel is genetic, a mystery gene passed through two families and connected (in some way) to the carrier's date of birth that becomes active when the carrier is 16. But only when prophesied by the Guardians... I think. Ok, some of the plot is a bit confusing, but the idea of genetic time travel is interesting, especially when all of the sudden you realize Charlotte isn't the actual gene carrier! Instead, with no training or understanding of what is happening, Gwyneth begins jumping back for 20 minute trips to the 18th Century! After finding out she is actually the time traveller the family has been expecting, this normal school girl must navigate the mysteries of both surviving random trips to the past (if she travels back while in the second floor of a building in the present, will she drop 20 feet in the 1800s?) and discovering the mysteries of the secret society guarding the time travellers and fully ingrained into the family history (and drama). Oh, and did I mention that the time travel can be controlled (or at least regulated) by the chronograph, an ancient device that "runs on" the gene carrier's blood (or uses it to activate the controls) and, when loaded with the blood from all 12 time travellers, will reveal some big secret or power - and that the original chronograph was stolen by Lucy and Paul, two of the previous generation, leaving the two final time travellers (Gwyneth and the slightly older brooding hunk Gideon) to travel back and get everyone's blood to complete the circle and reveal the power with a new chronograph?! Stealing the chronograph means Paul and Lucy are stuck in the past, but also are pitted against Gideon and Gwyneth in a cross-century race to control the destiny of the chronograph. And could Paul and Lucy be Gwyneth's real parents...? This all happens across centuries, but only about three or four days in the present, right after Gwyneth starts travelling. There is a bit more young adult fiction drama in this book than I'm used to in what I normally read. Oh my goodness, he's sitting close to her and she's blushing, the world is going to end! Haha, but it's fun still fun, and doesn't quite overpower the plot (though can distract from figuring out the mystery when the discussion gets sidelined by intense internal dialogue about his moody eyes and who he likes better). Thinking about the book from a young adult perspective, however, these interjections are not over the top and provide good insight into Gwyneth's sudden change while also being a regular 16 year old girl. Her relationship with her best friend, Leslie, who also becomes her researcher, was an interesting one. I thought they were setting up an actual relationship between them, with some of the word choice, but it seems it remains as best friends by the end of the book. What isn't made clear in this book is what the mysterious power is that will be revealed by completing the chronograph's blood work. Instead of having its own self-contained resolution, the book ends just as the plot thickens (in the case as Gideon and Gwyneth get ambushed by Paul and Lucy and new revelations are made that may tie into the fact Gwyneth can see ghosts). Means I need to get the next book in the series and keep reading this YA series! The narrator of this series, Marisa Calin, is great. Her beautiful English and variety of accents is worth listening to alone, but she crafts decent voices together to make the series better. Sometimes her male voices sound a bit like she's trying to speak in whale (long, drawn-out, low, over-pronounced...). I'm shocked to find out she actually trained and lives in New York (though I don't know when she moved from the UK to US). I'd listen to other works she's narrated. This YA novel is the first in a trilogy about teenagers who time-travel. The audio is nicely paced and engaging and was easy for the whole family (young teens) to listen to. The story itself has a great mix of suspense and humor. The ending is a bit up in the air and therefore a bit disappointing, but oh well, it just makes us want the next one. And the narrator is perfect. She made the characters come alive and her accents were flawless. We loved it! What other reviewers said is true; Ruby Red is not a novel, just the beginning of one. It's not that it ends in a cliffhanger--it doesn't--or that it sets up a sequel too obviously. It's that nothing happens, there's no arc, just a slow build-up and then a prologue. Imagine the Hunger Games ending before Katniss stepped in the arena or when she's in but only just begun. Imagine Pride and Prejudice ending with Jane's sickness. The time travel mystery seems overwrought so far. Gwyneth, a 16-year old time traveler, somes some spirit and intelligence, but needs the assistance and is therefore apparently bound to an organization of a bunch of sinister old men, a few women, and her fellow time-traveller, an older boy. At this point it doesn't seem like she's making many choices. This is not pure time travel. Visions, ghosts, telepathy, and apparently alchemy and magic all play parts in this world. The reader's voice and style were metallic and mechanical to my ears, a little grating and not a great choice for a dramatic narration in the voice of a teenaged girl. I'll start by saying I didn't know this was a young adult book until after I started listening to it. I didn't really mind, but thought perhaps the blurb for the book could have been more specific about this. The book had a good premise, was fast paced and interesting, but it was not a stand alone novel. It didn't have an ending, just a stopping point that prepares you for the next book in the series. I always find this an annoying quality in a book, and for that reason I only gave the story 3 stars. I love a good series, but for me, a good series is a series of stand alone novels that all tie together in the end. Marissa Calin's narration was the high point of the book for me. She did a marvelous job with character voices, her accents sounded authentic and she added greatly to building suspense and keeping you engaged in the narrative. I have to admit, I was so swept away with the great narrator of the audible version that it was only half way through the book that I realized it was rather stupid. What I thought would be more like Gail Carrigers' clever worldbuilding ended up being almost sexist, despite a modern setting. Gwynneth (Gwynnie) and her vacuous but eager friend Leslie are drawn into Gwynneth's family's time traveller mysery. Though how it is a myster with everyone and their brother talking about it throughout the book, I don't know. In the meanwhile, young Gideon,an experienced time traveller, spends most of the book looking down at the twit...er Gwynnie... and made her mad when he suggested she was one of *those* girls who go to movies, talk bad about others, and go to the bathroom in pairs. And guess what, by the time the book ended, she lived up to all those accusations. Yet we are supposed to believe an intelligent, driven, and dedicated person would fall for an airhead just because he considers her unpredictable. Unpredictable meaning she's so stupid that she just stammers dumb things instead of being 'seen and not heard' docile. Ugh. All the female characters were either idiots or mean. There was nothing in-between. None of the women had any backbone. Gwynnie's 'surprising act of bravery' was so implausible and lame that it made me roll my eyes. And then the book suddenly ends without anything resolving. As if the author got bored and just stuck an epilogue in there randomly so she could say she completed a book. That said, the narrator was awesome and could almost make me have liked the book, if it wasn't so inane and sexist. What disappointed you about Ruby Red? What was most disappointing about Kerstin Gier and Anthea Bell (translator) ’s story? I’ll admit that the first thing that popped into my head when I read the title was a very delicious (my all time favorite) vodka called, Deep Eddy Ruby Red. She’s a cruel mistress, this ruby. Alas, though, it might have had a bearing on me deciding to start this trilogy.While I was gathering my thoughts on this one, I began to wonder if it was a “young adult” type book because the whole thing was a bit unsophisticated and the characters clearly innocent. Mind you, if the story’s good enough you don’t always care, but upon further investigation, I realized that I nailed it. Interesting concept about a family who has the time travel gene, but frankly, it’s just not that great. The end is a big cliff hanging screamer, “you’ll find out in the next book!” This one made me shrug and say, “Meh” I’m not sure I care enough to read the next one, “Emerald Green.” Though, well, I love the color green. Maybe picking books based on Vodka and colors isn’t the best choice? An amusing enough, but very childish, story with the worst romantic plot I've ever encountered in YA. What did you like best about Ruby Red? What did you like least? This is just the beginning... it should have been released as a part of a book rather than a stand alone book. To avoid frustration, wait until you can have all 3 parts. Has Ruby Red turned you off from other books in this genre? I really enjoyed this story. I didn't notice any of the problems that others found with the narration. The ending did seem a bit rushed, almost like the author forced a segue for the next book. Some parts made me laugh out loud. Overall, I recommend this book for anyone who is a fan of the current, popular youth fiction choices out today. I know that a lot of young adult (especially supernatural young adult - is there any other kind these days?) has questionable logic and behavior, presumably because teens don't think all that much of the motivations and reasoning of grown ups, but this book is extra absurd. Not only the behavior of the protagonist's mother, who irresponsibly endangers the girl, and the lack of sympathy for the poor cousin, who (as it is mentioned before she is mocked) is a real victim of the situation, but the inexplicable actions at the end of the Really Hot Guy. It's like the author didn't want to end the book without checking all the boxes. Disappointing, because this could have been an interesting blend of historical fiction and sci fi/fantasy. Great reader. Fun story. Very imaginative. Teen and up would enjoy.